During World War II, three successive occupations – by the Soviet Union, Nazi Germany and the Soviet Union again – wiped the nations of Estonia, Latvia and Lithuania from the map of Europe. When the war was over, hundreds of thousands of refugees from the Baltic states found themselves in limbo in displaced persons camps in Germany – unwilling to return to their still Soviet-occupied homelands, but often with no idea where to go from there, or if any countries would even accept them. Many stayed in the camps for several years. Despite the obvious material privation, among the greatest hardships reported by refugees was the sense that there was no future. All three countries had strong traditions of auto-didacticism, and had had very high literacy rates and levels of participation in higher education before the war. The Baltic University in Exile was established in March 1946 in Hamburg, at that time in the British Zone of Occupation, by academics from Estonia, Latvia and Lithuania who had become refugees. It operated for three years and educated hundreds of students from all three countries. Film-maker Helga Merits grew up in the Netherlands, the daughter of an Estonian refugee who had studied at the Baltic University. She is the director of the recently released documentary The Story of the Baltic University, and in this article, she tells Deep Baltic about her motivations and the experience of making the film. Tragedy, hope, success – all the elements for a great story were there and yet there had still not been a film made about the Baltic University. It was hard to believe. The Baltic University was such an unbelievable achievement: who could imagine that refugees who had lost everything could create a university, so soon after World War II, in an almost totally devastated city? The story should have been made available to a large audience one way or another, but I found it had not been. So I decided to make a documentary film about it: The Story of the Baltic University. I didn’t know anything about the Baltic University, even though I knew quite a few people interested in Baltic history, until the day I found the study book of my Estonian father amongst his papers. Sometimes I wonder if I would have made a film if I just could have asked my father what the Baltic University had been like, but this was not possible, as he passed away when I was still very young. I had to find out myself. I was in contact with some Estonians of his generation, and happily some knew and remembered about the university. One of them sent me a text about the year 1946, when the university was established, written by a certain Robert Riggle. 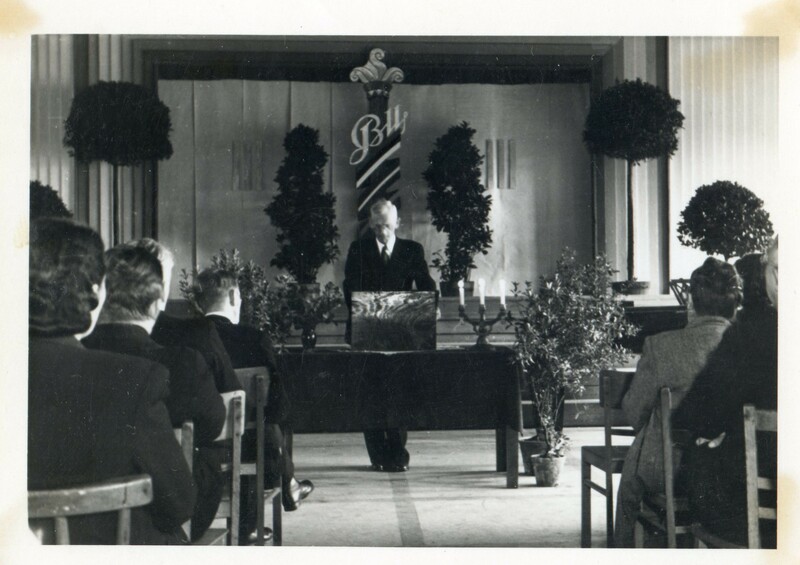 In 1945, Mr. Riggle had been working for UNRRA in Hamburg and had heard about the plans for a Baltic University. He was truly amazed, if not perhaps shocked, that people, refugees, were not only thinking of creating a university, but were actually organising it. In Hamburg there was a shortage of most of the basic things necessary for daily life, but there was still this idea, there was the courage and determination. Riggle decided there and then he wanted to be a part of this adventure. Riggle’s enthusiastic text, the story of how the Baltic University was created, was at the back of my mind for quite a few years. When a former Estonian student encouraged me to look for other students to see who was still alive, I placed advertisements in Estonian, Latvian and Lithuanian newspapers. To my surprise, I received very enthusiastic responses from people from all three countries. I realised it would be possible to make a documentary about the Baltic University. I had names and contact addresses, I had a great story from Mr. Riggles, as well as a few pictures and some documents. But I needed to have much more material if I wanted to make the film. Then there was time pressure, as the former students were not that young anymore. Another problem was that the former students lived in different parts of the world and I had no means to travel to everyone and do all the interviews myself. I had to organise this from a distance. For my editor, Leo van Emden, this turned out to be a technical challenge: interviews were filmed with different cameras, the sound was not always very good and sometimes he had to work on the images as well. And not only were the interviews of differing quality, so were the historical material and pictures. I think he has done a fantastic job. The documents and other material relating to the Baltic University were spread all over the world and so searching for it took a long time, as it was necessary to look everywhere. Sometimes I felt more like a detective than a film-maker, trying to trace photographers, cameramen or their archives. Trying to locate documents and special pictures, but also people or their families, I had some spectacular finds, like discovering the whole archive of the Baltic University, which turned out to be in Uppsala Library in Sweden, but had been forgotten, as well as footage of the Baltic University of 1948. But of course there were times when I had thought and hoped I was searching in the right direction but it turned out to be a dead end. It is really due to the help of a lot of people that it was possible to finish the film: so many people helped by asking around, writing to and interviewing people, searching in archives, scanning documents and pictures, looking for support… In the end, I can only say “we made it“. The amount of enthusiasm, help and encouragement received has been heartwarming. It took me three years to finish the project. Though it was not always evident I would be able to finish the film, I had very much hoped it would be possible to do so; I so much wanted to tell the story of the Baltic University, since it is a story we can still learn from today. Working on the film, I watched a lot of footage of refugees in 1944, 1945 – so many people on foot, heading towards the West. These images are very similar to what we see now. In 2013, the UN stated that for the first time since World War II the number of people who were refugees had exceeded 50 million. Now the number is much higher. Most important now, as it was then, is education. If you have lost your home, your country, all that was familiar to you, the most important thing is to start building a future. It is a cliche, but knowledge is something you can take with you wherever you go. Therefore, it should not be necessary to wait until it is certain whether a person can stay or not – as this is sometimes a long procedure. Eduard Bakis, who had been a lecturer at Tartu University and after the war taught psychology at the Baltic University, wrote about the depression in the refugee camps, “caused by the fact that after a certain period it seemed to refugees there was no end to the life in the camps.” To have the possibility to work on your future was and is of vital importance. As with the other documentaries I have made, I wanted to tell and show a story which was not really known to a wider audience – and a story which is in my view important to tell. Like my other documentaries, it is about history, but there are parallels with today. The stories are told by elderly people who have been able, despite all the tragic events they witnessed, to make something of their lives. Seeing the seven former students in the film, it is amazing how much energy they still have and how they are still full of high spirits. To me they are great examples. The story of the Baltic University is a tragic one, as it is about refugees who lost everything, but it is hopeful at the same time, as it shows what can be done, what results can be achieved, even in most difficult circumstances, if you work together and have a common goal. Helga Merits studied philosophy in Amsterdam. She worked as a journalist for national radio and newspapers in both Belgium and the Netherlands. Kallis Paul was her first documentary film (2006), for which she received the Theodor Luts price. The Story of the Baltic University is her fourth film.